What are the misspellings for paris? What are the common mistypes for paris? 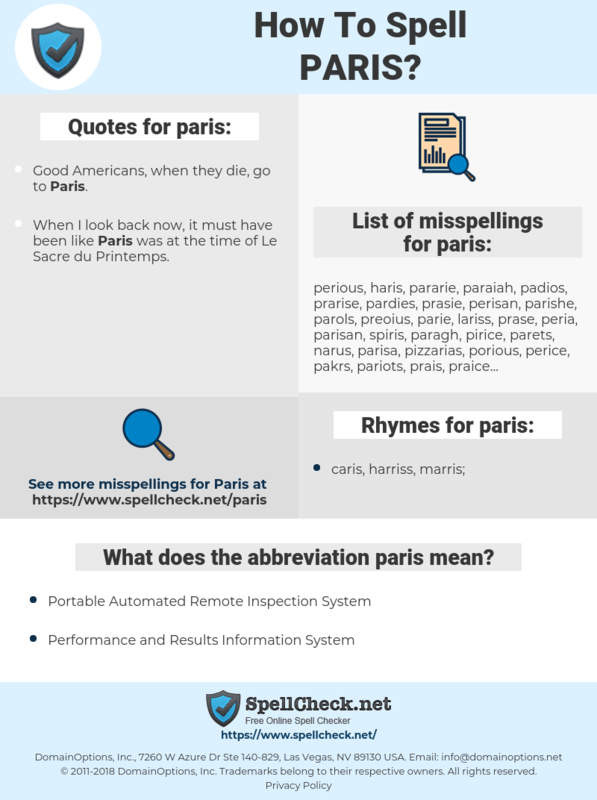 What does the abbreviation paris mean? What are the quotes for paris? What are the rhymes for paris? What are the translations for paris? 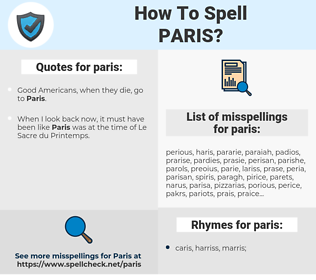 What are the common typos for paris? Paris as a girl's name (also used as boy's name Paris), is pronounced PARE-iss. It is of Greek origin. Name from Greek mythology. Also place name: Paris has also been used in English as a surname for immigrants from the capital of France. The city was named after the Gallic tribe that founded it, the Parisii. Socialite Paris Hilton. This graph shows how "paris" have occurred between 1800 and 2008 in a corpus of English books. When I look back now, it must have been like Paris was at the time of Le Sacre du Printemps. Well we really meant you to visit Paris in May, but the rhythm required two syllables.